Gary Vaynerchuk is a serial entrepreneur with a proven track record, especially in online wine retailing. His latest book explores the emerging world of social media marketing – Twitter, Facebook, LinkedIn, and the usual gang. It has some great nuggets of insight, but on the whole disappoints. Here is my review of this important but flawed book. Business books are always looking for that great, new angle. Gary Vaynerchuk’s The Thank You Economy is no exception. His keen insight: the Internet economy – especially social media – makes saying Thank You more important than ever. Amazing customer service is his war cry for businesses everywhere, and Vaynerchuk warns us all to adapt (rapidly) to the tsunami of social media that is changing business today. I look forward to these books, because every once in a while there is an amazing gem, such as Seth Godin’s, Unleashing the Ideavirus – a book that knocks me off my socks, makes me pause, and is the the first time I every thought a thought: that an idea could be a virus, how cool is that? The Thank You Economy disappoints. Especially in the details, it disappoints. We are teased, threatened, cajoled, implored, reminded, asked, coddled, hassled, tipped off, and otherwise pounded with the message that social media marketing IS a revolution and we (as businesspeople) had better get prepared. But beyond that? Not enough details! Not enough meat! Not enough concrete do’s and don’t’s. For instance, the idea that customer service is critical in today’s Internet age is hugely important. Some customers – we might call them CUSTOMERS FROM HELL – can make life measurable (and they have) for major brands like KFC, Taco Bell, United Airlines, and others. Should you (or can you), provide amazing customer service to your own customer from hell? What happens when one customer from hell alerts the other customers from hell that those who kvetch the loudest will get amazing perks? Vaynerchuk doesn’t really explain this, sadly. So he raises the point that we should have amazing customer service, but doesn’t help us in the thickets or weeds. Which customers? All of them? That’s not realistic. Some of them? Which ones? When, where, and why? The Social Media Revolution is certainly coming, but it isn’t feasible to do everything for everyone at no cost. That’s the starting point for a good book, but in the case of the Thank You Economy, it’s really the ending point. Give great customer service. Be amazing. Treat every customer like they were No. 1. Lots of platitudes here, little details. Sigh. Yelp! Oh my God do I love Yelp. No more terrible BBQ in Texas! No more terrible B&B’s in Half Moon Bay! Yelp and stranger marketing have changed – forever – how we shop. Yelp’s genius was allowing everyone to post reviews, easily, and to encourage Yelpers to Yelp and businesses to get Yelped. In the best part of the book, Vaynerchuk has an amazing compare / contrast of Yelp (Free) vs. Zagat (paid), pgs. 38-41. Rip out this part of the book! Paste this part of the book above your desk. It’s the amazing, power of FREE vs. PAID, and the hypercharging that FREE gets on the Internet. This one case study is worth the book, not for its originality but for its CLARITY. Vaynerchuk’s touches on other examples (Barnes and Nobles / Borders / Amazon) but drops them. Oh, my goodness, the devil is in those details, and had the book had strong case studies, the Thank You Economy would have been an amazing read. Corporate America is rewarded for hookups and one-night stands, and that’s how much respect most corporations show toward their customers. Don’t hate the player; hate the game. (pg. 210). Oh my God. This could be pasted on a “Successtory” poster and put on top of the urinal in my bathroom. That’s how amazingly insightful that is. Sigh, sigh, sigh, sigh, sigh… I want the details! I want concepts! Death to Successtories! All in all, I did like the book. I read the whole thing. Admittedly on BART, with several Bay Area crazies shouting and being drug-busted around me… But this sort of book is a book that I hate because I love it. It could have been such an amazing book. 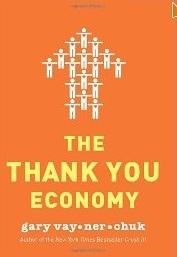 The Thank You Economy is such an amazing concept, but the execution of the book was terribly flawed. I feel like I read draft No. 1, when what I needed was draft No. 10. The devil, my dear friends, is in the details.